Annual Programme number 8 got under way on the 29th MAY despite significant opposition from weather and road closures. Twelve “early birds” (advance party) set up the necessary infrastructure ready for the arrival of the 41 participants still to come. Kevin Dawes excited all with the new accommodation arrangements. 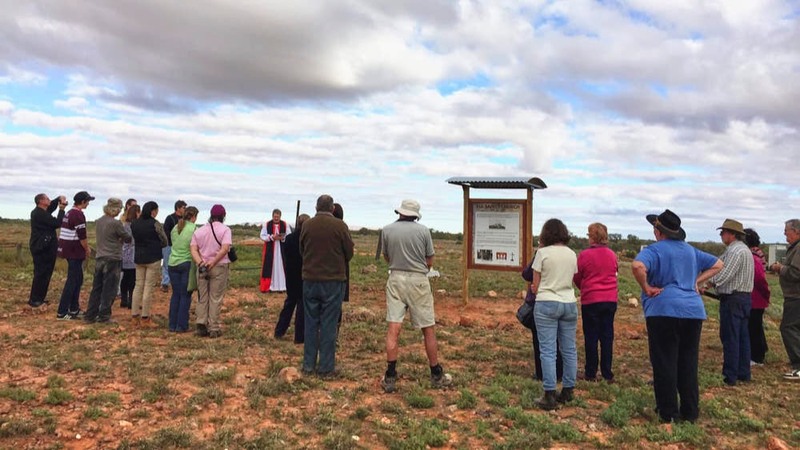 An extension of the established campground, 1000 metres east towards the Marree Road on the Farina Creek. It is a very natural, pleasant setting. Well done Kevin. 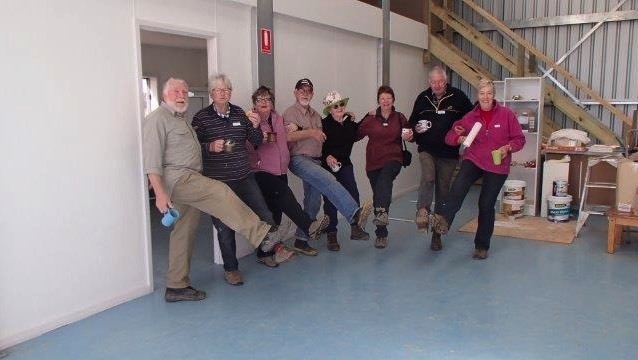 Week 1 was dedicated to laying the groundwork for an effective campsite, getting the Bakery “cooking”, the merchandise section “selling”, and bringing the new 18 metre x 12 metre Operations Centre shed up to a working model. During last year’s programme the shed was built to lock up stage. Eight diverse and separate work teams, each with a well prepared agenda, set about their respective tasks in an amazing separate, but integrated manner. There was great display of leadership, skill, sense of purpose and good humour across the whole programme. Assistants in their roles were equally as important as the skilled leaders, across all eight teams. The pleasure and sense of achievement was shared across the campfire each night at HAPPY HOUR. As each day progressed, all were able to appreciate how well the new building fits our present and future needs. We look forward to seeing the finishing touches successive crews have added. An important 11th hour addition to the basic building last year was the installation of two rainwater tanks off the shed, enabling us to have independent pure water available to supply the bakery and for volunteer usage (45,000 litres !). 1. A dry goods store, capable of holding 750 kgs of flour and other bakery requirements. 2. A large vertical 2 door freezer, able to hold two weeks supply of critical ingredients. A major structural defect was discovered in the wall of the old Post Office, which had been considered one of our pristine structures. It proved to be sufficiently serious to engage both our professional stonemasons full time for five days to save the structure. Even with low level visitor traffic on the “track”, our bakery and merchandising team made good sales. Many commented that this was a great team to be part of and co-leaders, Tom Harding, Ken Blackman and Di Silva, agree it was a great team to lead. This year, 163 people representing 104 families nominated for volunteering activity at Farina, a 25% increase on 2015 numbers. Adverse weather forecasts and some road closures created uncertainty for travellers, with sometimes a one day stopover necessary en-route. This impacted on tourist traffic numbers at stages on the northern roads and campground arrivals. 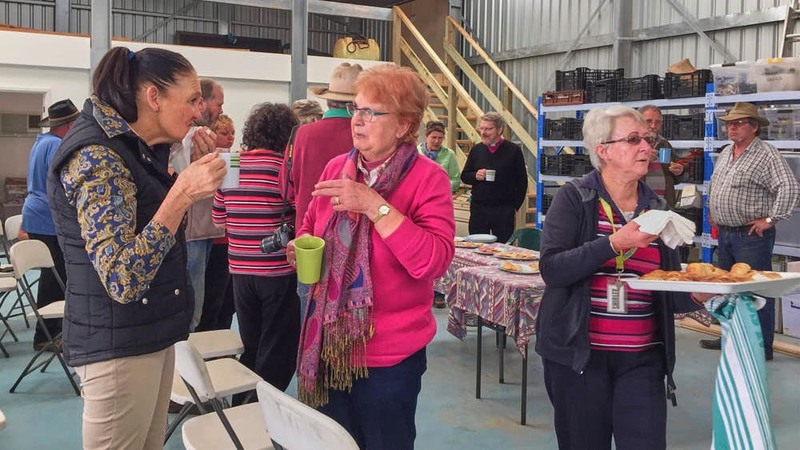 However the bakery, café and Information Centre staff achieved a significant sales performance to the delight of both customers and volunteers. A larger stonemason programme is being implemented this year, partly from necessity and the rest as planned. 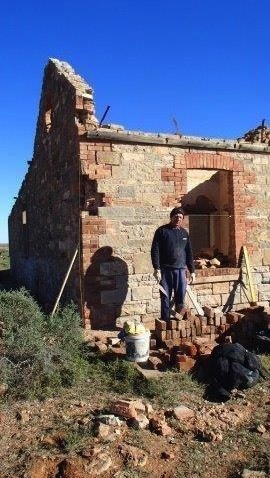 One of ‘icon’ buildings, the Post Office, has deteriorated dramatically recently and required intense rectification from our professional stonemasons, Peter and Ron to secure it for the future. Other buildings receiving attention were the ‘Fettlers Cottage’ (the building close to the road entrance), both “new“ and “old” Police Stations and the Railway Guard cottage (near the water tower). More specific details will follow from the respective work groups. RAAF 10 Squadron, Wing Commander Annalisa De Vries conducted the ceremony with other serving members participating. The standard of workmanship and quality of outcomes in every aspect of activity at Farina reflects great credit on all participants. 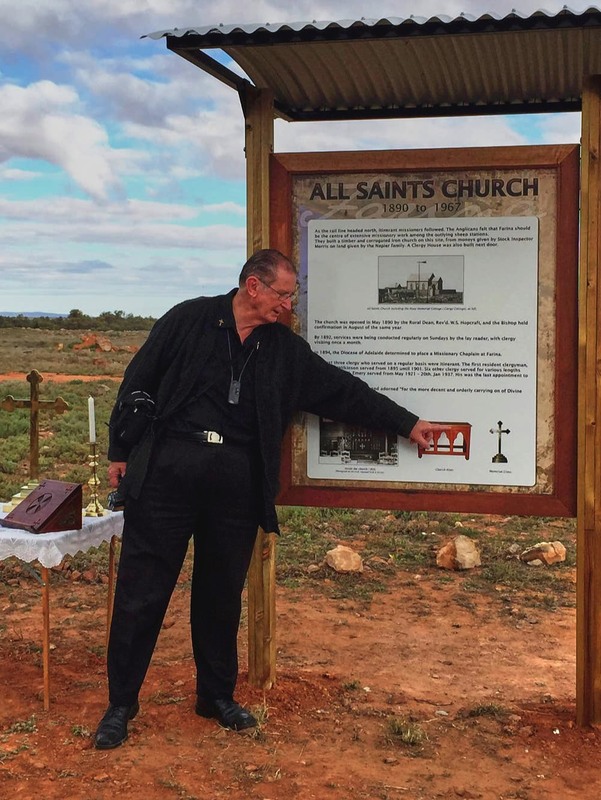 It is certainly attaining status as an historic inland Australian township. The progressive fit-out of the new shed will enable it to operate as our work headquarters from the outset of 2017 program. The efficiencies it will provide are very obvious. It will also provide secure storage off season for all our ‘wheeled’ equipment. 1. A dry goods store, capable of holding 750 kgs of flour and other bakery requirements. 2. A large vertical 2 door freezer, able to hold two weeks supply of critical ingredients. I have just returned home after having the privilege of acting as team leader for 2 weeks of the volunteer program. What a wonderful group we had over this period. Following on from weeks 1 and 2 and completing the work planned for 2016 on the railway cottage. It is again in great shape and considered to be the best building on site. A phenomenal job on the old police station with Ron being very impressed with the tidiness and ordered stacking of the various stone soil and other materials excavated. The Eastern corner wall needs more stone structure to support it and there is considerable pointing to be done. Considerable progress on the shed with all electrical, construction and organisation being pretty well completed except for painting. Complete tidying of the cemetery including the small plot. Another theory behind this small plot is that suicide victims may have been buried there. Good progress made on the Exchange with extensive pointing having been completed. There is a large section of internal walling that requires attention to make it safe and ensure it does not collapse. Not forgetting the mundane routine chores that are done everyday without complaint. Although great satisfaction comes from contributing to the funding by selling bakery products and merchandise. A special thanks to Derek and Kae for your support and can do attitude and Kevin and Anne for putting up with us all and doing so much to help. In summary we lost 4 good trading days due to the weather but there was not one complaint about the very muddy sticky conditions and everybody still got in and helped wherever they could. Every person that attended weeks 3 &/or 4 can be very proud of what was achieved and I thank you for being so co-operative and friendly. I look forward to meeting everyone again if I am lucky enough to volunteer at the same time or maybe on the road. As the person in charge of the bakery operations I would particularly like to thank the bakers that have taken on the responsibility of running the bakery over the 8 week program and welcome you back if you should choose to return. The new group started to arrive for a wonderful fortnight ahead. The weather though was very changeable, we immediately had just over 3mm of rain on the Sunday evening, and the ground was already sodden from the previous rains. 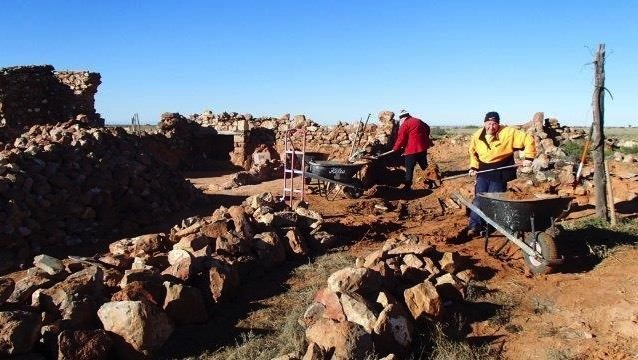 This led to camp maintenance team getting bogged rather badly near the shearer’s quarters, having set out on an errand that would not take very long at all, however Phil & Dawn, after about an hour were starting to be missed!!!. By coincidence Alan & Steve heard their engine roar, which led to a full recovery. The bad weather continued and the road from Lyndhurst was then finally closed, the campgrounds were almost deserted as campers disappeared as soon as more rain was mentioned. We closed the bakery in the afternoon and prayed for the road to open in the morning. 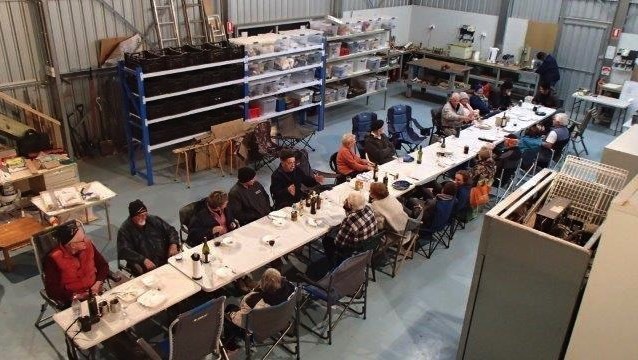 We had the first of our "happy hours" early in the shed. During the 2 weeks we also made our own entertainment with a few unmissable jokes from Johnno and some very good poetry from Julie & Allan. Monday and the roads were still closed but we were ready. Within an hour of the roads opening in the afternoon we were already in the bakery with beautiful products for our visitors and the last 2 hours were very busy, a great end to a slow start to the day. Our 4 bakers and many of the café/retail staff did a fantastic job of always being available to meet the challenges of the day, be it running out of food input products or queues of hungry visitors 5 deep waiting for service. Great job! Our project works however continued unabated with preparation underway for the start to the Fettlers Cottage planned for the following morning and the future “A Team” led by Doug commenced painting the new rooms inside Tom's shed. Unfortunately we had to say farewell to Johno’s team after their first week, but work continued with a very enthusiastic “Stonies” team until it was completed. Monday was also Dawn Morrison’s birthday, what an evening of fun and birthday cake we had. 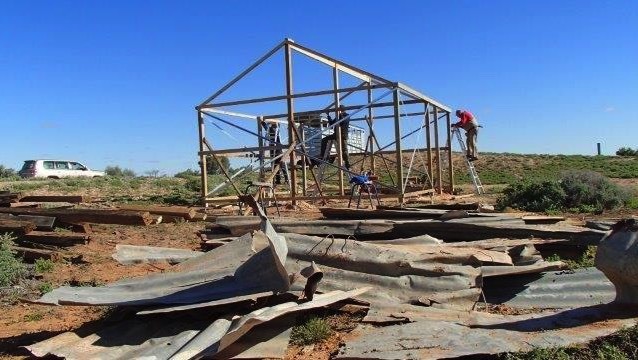 From a pile of torn and bent corrugated iron, the shepherds hut started to rise from the “ashes” led by Drover Jack and team. This used to be where the shepherds lived. 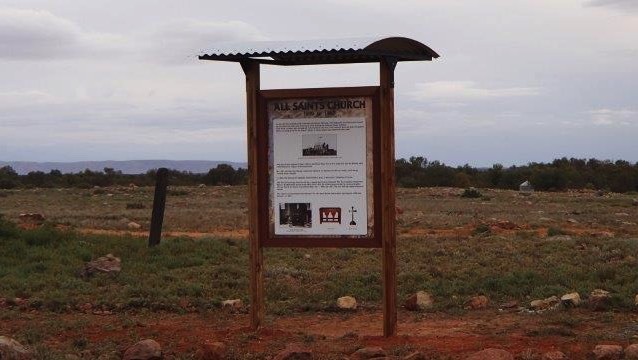 They used to corral the cattle and sheep brought down from “Anna Creek, & Farina stations” and in from surrounding pastoralists, before being loaded via the sheep & cattle ramps onto the train for transport to Adelaide. This was just a simple structure and life would have been tough in the day. 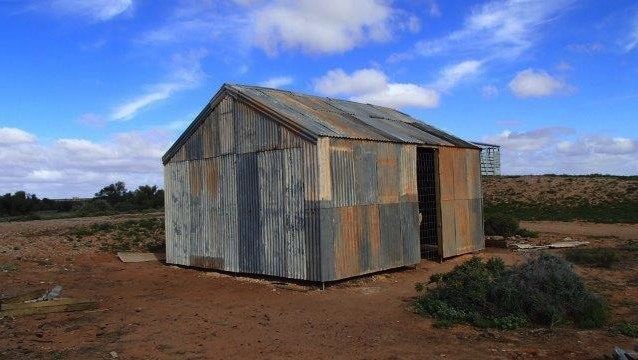 Many thanks to Kevin & Ann Dawes for providing some of the many corrugated sheets required to finalise the Drovers hut, removed from one of Kevin’s sheds. .(with his permission of course). 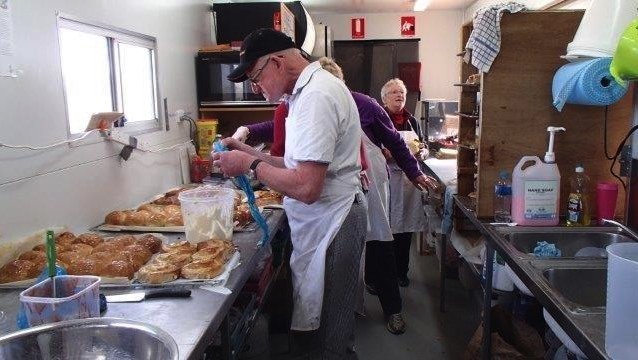 By the middle of the first week roads started to dry out and visitor numbers increased, the bakery started to make a full recovery from the wet days. 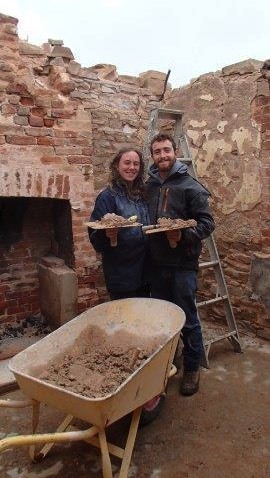 New projects commenced with vigour, the old police station was under attack by David & Helen who very selectively removed tonnes of sand & rubble. Oh what great surprises as the buildings structure started to see the light of day. 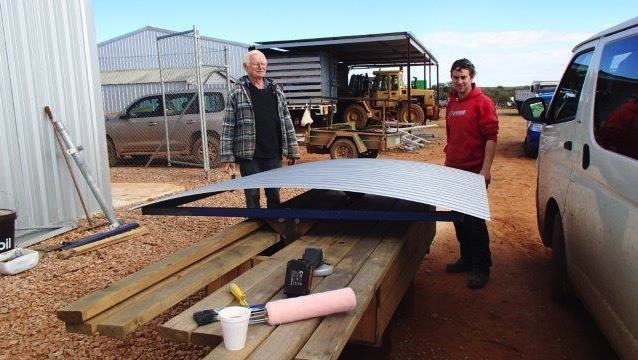 Jimmy & Nick started the fabrication of the new roof design for the story board pergolas having enough material to make 4 units. 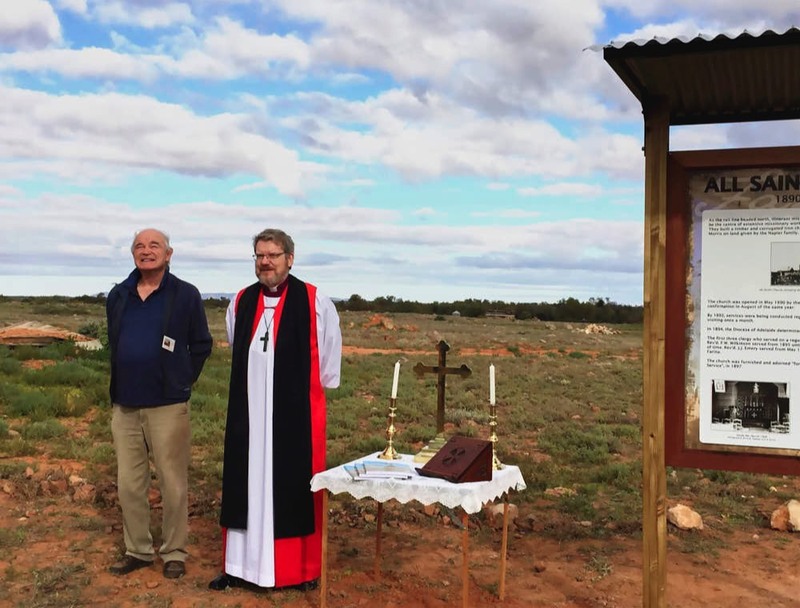 One was later erected adjacent the Anglican church for the official blessing during week 7. 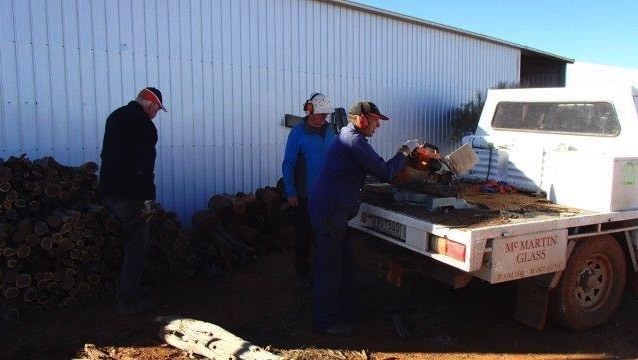 The “Mulga” wood run, was undertaken by a very enthusiastic team who quickly collected a trailer and ute load of fence posts, and cut them all to a suitable oven size by knock off time that day. Ron (the baker) and Doug (from the A team) left during the middle of the week and on the way home, kindly, delivered some of our fantastic bakery products to Hawker & Quorn café owners who graciously provide Farina tourist information. Many thanks to Mick Hunt who managed to bring a ute load of “redgum” wood all the way from Horsham to supply the oven and keep the coals hot. We had a minor glitch with the proving oven, when one of the heating elements packed it in. One of our resilient bakers again made do until we could get a new replacement, luckily David was on hand to fault find and re-install the element. 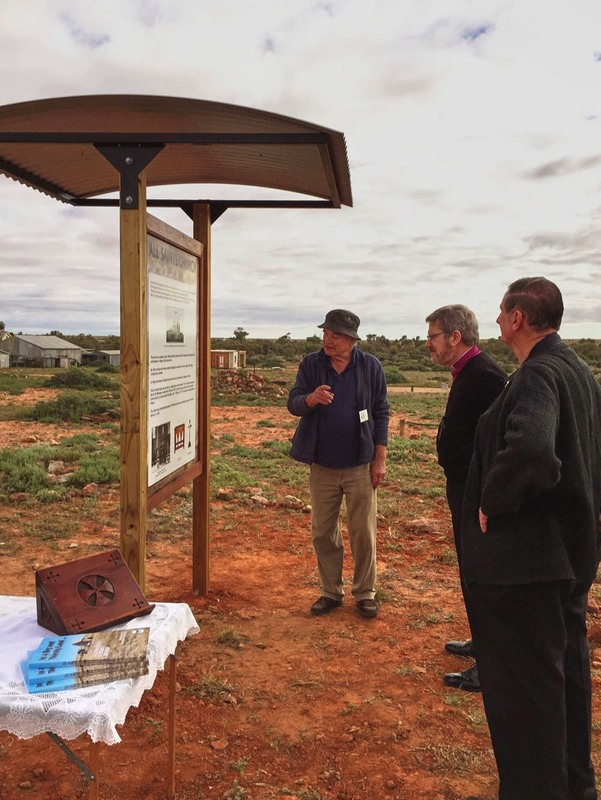 By the end of the first week visitor numbers were increasing as the “Big Red Jimmy Barnes” concert drew many thousands to Birdsville. The café and shop went onto overdrive and the main street became a parking lot, full of caravans and four wheel drives. A team we later called the “Oilers” stated work on the sheep ramps. This required using old engine oil mixed with a bit of turps, being painted over the entire wooden structure. The oilers led by Julie claimed this job as their crowning glory!! I couldn’t prize them away. We were having the usual happy hour one evening and a very disenchanted motorcyclist walked into camp. Sam (a philosophy student) was trying to ride to Witchelina but in the very soft roads became bogged and burnt the motorcycles clutch out. Stranded he sought our help, once again our FRG recovery team (David) jumped into action and drove out with a large trailer and picked the bike up. It took a few days to arrange transport out, Sam meanwhile helped out around the stonies and café, we soon got him on his way back to Adelaide, and eventually home to Melbourne with his father. 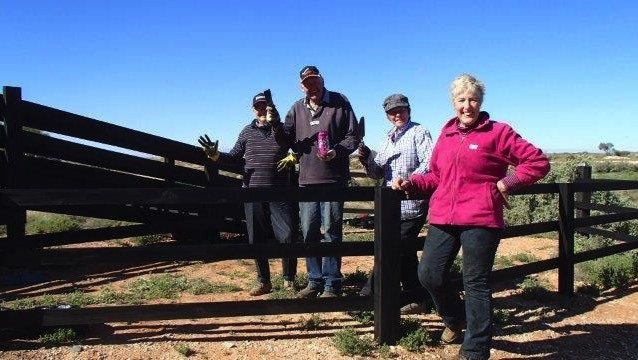 By the middle of the second week projects were coming to fruition and we were very fortunate to receive a visit from ABC’s Ginny Stein 7.30 program. Ginny was a one journo band doing all of the interviews and camera work on her own. The program went to air and you may still see it on iView if you missed it. See http://www.abc.net.au/7.30/content/2016/s4505979.htm for our 6 minutes of Farina fame! 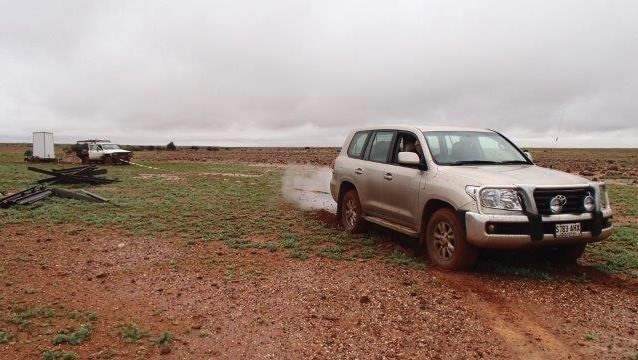 By Friday we were very busy again with the patrons of the Jimmy Barnes concert stopping for bread, cakes and pies on their way home, traffic to and from the “Camel” races at Marree and of course the school holidays. The camp grounds were absolutely overflowing. Our last weekend saw a few of our very highly praised volunteers depart for home. Although very busy, what a great fortnight, we all had. 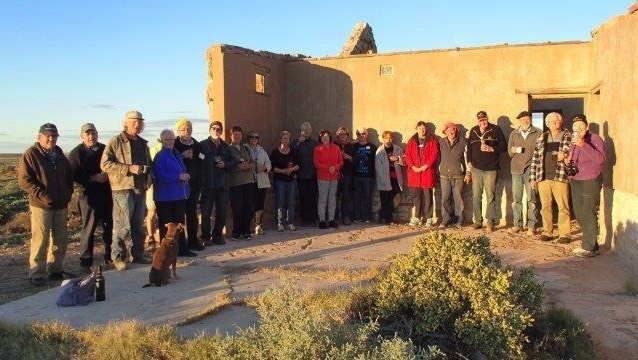 My thanks to ALL who participated and supported bringing life back to Farina and assisting Pat and myself work through our first leader fortnight and all the normal demands and day to day activities and many, many, visitors. 2. Best foot forward by the "A Team"
The low numbers particularly in week 7 required modifications of the operating procedures to ensure that Ron Johnstone was supported on building operations on the Old Police Station and the there were enough helpers in the Café. In particular morning and afternoon teas were often taken in the Café and it was not possible to have a specific person on merchandise sales. In spite of the numbers we had excellent teams with great outcomes. Pointing and stabilisation of the old police station was carried out over weeks 7 & 8. 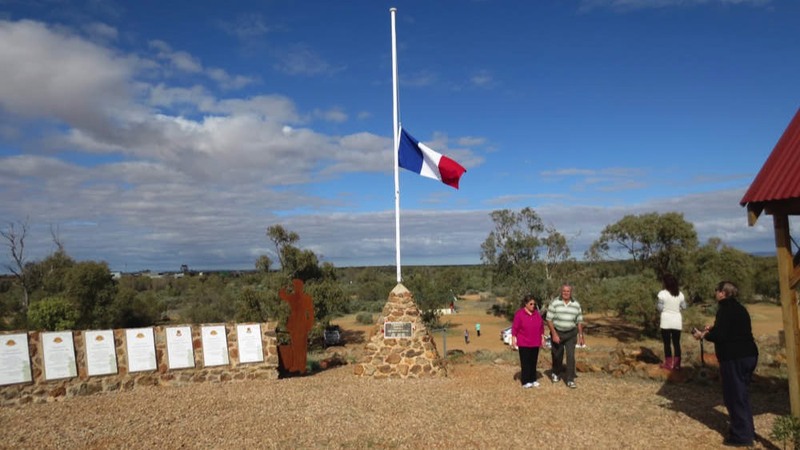 We flew the French flag at half-mast for 3 days of solidarity with the French people. 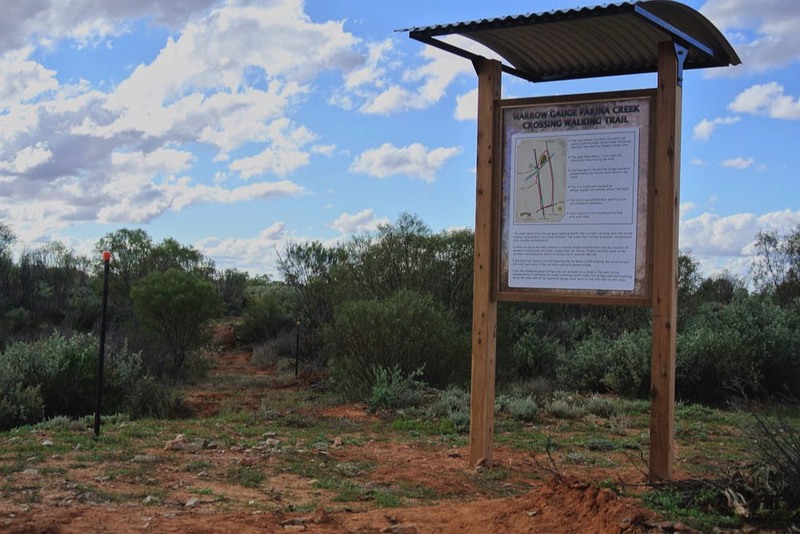 The Old Ghan river crossing trail was cleared, marked and storyboard constructed and erected. An additional map was attached to the Standard Gauge Northern Bridge. We cleaned up around the Anglican Church. Scrap wood and iron was removed. We removed all surplus iron from around the Stockmans Hut. We constructed the new style pergola, which were approved of by the teams. We made the campfire friendlier with a new site and lights. The Last night celebrations were at sunset at the Transcontinental Hotel. We had a great team of volunteers who accomplished more that was asked even though for many of them this was the first time at Farina. As usual our work would not have been possible without the help of Kevin and Anne Dawes whom we thank. We hope to see you all back in the future.